But first, let give some context; there should be a clear differentiation between challenge and approachability. I’m a huge proponent of games being accessible, as I think all people should be able to play games, regardless of their backgrounds or personal handicaps. So its the designer responsibility to clearly explain the rules, and give an understandable difficulty curve to the player. In Extremis was planned for accessibility from the beginning; it’s no accident it is a 2D shooter, as it is the simplest genre to understand to people who haven’t played games in a while; you just have to carefully manage you XY coordinates in different contexts, without having to care for further complications like acceleration physics or simultaneous WASD and mouse control. That said, once the player is in, he is in for good, and to get to the end, should be on his merits only; his conflict with the set of trials the designer present to him. Difficulty, is of course subjective, and its often preponderant not to player intrinsic skill, but to his accumulated experience. And that’s valid to all mediums; some books that a lot more work than others to get to. As a dilettante reader, who takes months to get through simple crime or science fiction novels, I know that. Should I pick something like Finnegan’s Wake or Ulysses for my next read, I would probably take me as much time as, let’s say, for my (avid reader) sister to get a 1CC at DoDonPachi. Which makes, for me, several current tendencies in game design troubling, especially with the videogame intelligentsia tendency to reject foundational elements of the videogames medium, such as scores and lives and continues, as frivolous, in order to champion fetishistic experiences that dress themselves as something aesthetic complex, but really are not. While the looks of games like run’n’guns and shmups may seem puerile, the true richness of those game reside in the tension of their challenges, and the myriad of actions on player can perform in them. But back to the topic of difficulty, shall we? Due to that philosophy of accessibility, one of my early goals in INX were for it to have an adaptive difficulty system; one that would selectively change aspects of the game by reading player’s behavior, in order to constant refine the challenge curve, and give the player the coveted state of “flow”. Of course, it’s always easier said than done. Initially, I conceptualized difficulty by interfering with elements of the game; not only in stuff like enemy speed or bullet spread, but also enemy position and behavior of environmental threats (bullets are far from the only thing that can get you in In Extremis…). Of course, difficulty only started being built when enemy behavior and stage design was done, and that took almost all of the development time. That required to redesign where difficulty would actually change; now, only the inner behavior of enemies and bosses would be altered, while setpieces remained constant. That also proved remarkably simple to implement, as bullet pattern can have tremendous variations visual variations by just simples numerical exchange (also, reviewing enemy patterns make me realize how code can be beautiful, which is like, the supremely nerdy thing to do). But doing such simple tweaks can be complicated; sometimes, you get the desire to just crank values up, without realizing that they can break the visuals or the flow of the stage.In INX, each level has a distinct type of challenge; in a level, for stylistic reasons, all bullets have low speeds; in another, the delay in which bullets patterns are shot can’t be changed, because said patterns are synchronized to music; some stages challenges lie in avoiding enemies, so their size and speed matter, and in other, the challenge lies in reading the level cues and reacting accordingly. As you can see, it’s a delicate thing to balance properly. 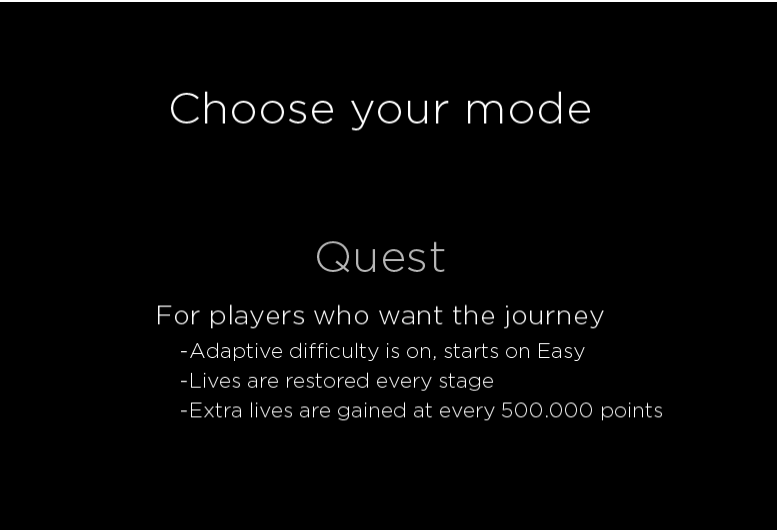 Another solution beyond the adaptive difficulty was the creation of different modes of play; Quest, for players who are new to games, Trial, for players with more baggage, and Awakened, for the shmup connoisseur. Those modes would shape the player experience, affecting the difficulty, and giving stimuli and bonuses adequate for the respective player profile. They’re remained on the final game, but only as an initial set of configurations, more than anything more present through the game. Instead, I opted for a set of options that can be easily changed through the game; even the adaptive difficulty, something I thought would be perennial in the game, is now togglable. In the end, difficulty can be more a matter of philosophy, as a game with a single preset is like an immutable text, with one interpretation; multiple difficulties means multiple “gospels” to follow, and believe in. Some might even be considered apocrypha, but faith is faith. Players should be able to have freedom on how to approach the game; after all, the game belongs to them.